Combines the convenience of a visual indicator to signal the proper time to change the dressing, along with the added feature of tapered edges to reduce rolling and bunching up. Both features offer the benefit of potentially reducing premature dressing removals. Fewer dressing removals can produce increased cost effectiveness, as well as reduced pain for the patient and reduced disruption to the wound bed. Thinner than DuoDERM CGF and Border dressings, and SignaDRESS; leading to improved translucency and ability to monitor the wound. Consists of a flexible, polyurethane film outer layer and adhesive skin contact layer that contains a unique hydrocolloid composition. 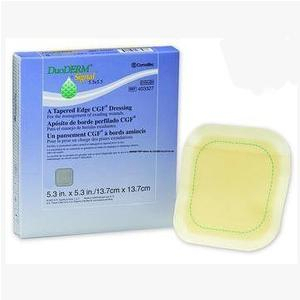 Provides an optimal moist wound environment that is supportive of the healing process. Outer layer is a nonstaining, moisture-resistant surface that is easy to clean, and provides a viral and bacterial barrier while intact and without leakage. Can be used as a primary dressing, and is a highly effective secondary dressing for use over wound fillers.